There is no doubt that China has a culture much different than that of the United States. Intense mental preparation is required and we were ill prepared to handle some of it. The lack of personal space, Disney World-esque lines (at all times and everywhere), rude local tourists, guttural hacking and loogie spitting by both sexes (in restaurants, on store floors, subways…everywhere really) are nothing compared to the main thing that every traveler to China needs to be aware of before going. I cannot even say “prepare for” because that is a physical impossibility. We were cognizant of it before arriving and were still dumbfounded when we witnessed it firsthand. 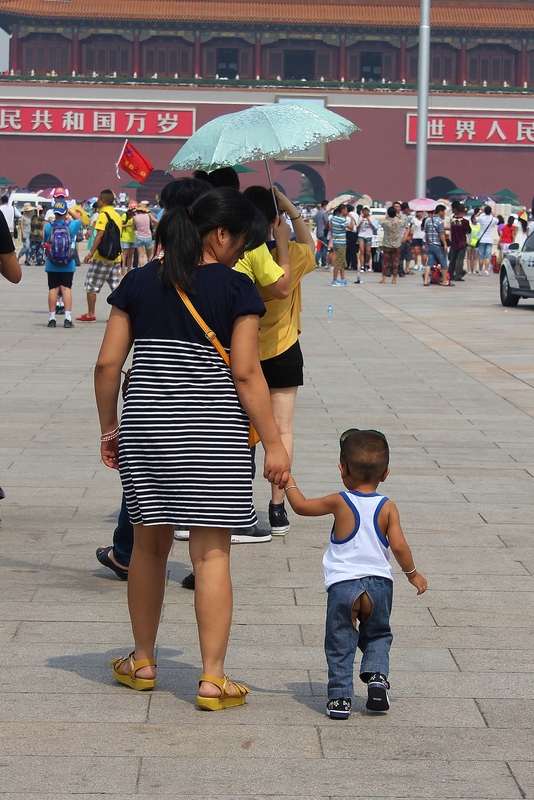 In China the majority of little children wear shorts or pants that are crotchless. Nug and I started to call them “splitties”. The strange thing about this garment is that the toddler is open to the world with no diaper or anything protecting their junk AT ALL! Now I do envy the associated freedom but it seems quite odd to let your kiddo run around a filthy city with no safeguard. Any time they sit, walk, or are held by their parents they are just flashing the whole world. We saw splitties in subways, public parks, restaurants, riding on daddy’s shoulders…everywhere. Is it weird that we took a pic? And this leads to the disturbing reason that roughly 25% of the world’s population wears splitties when they are a litter nipper… in order to take a dump or pee wherever and whenever it is convenient, right there in front of everyone. The number of times that a crowd ahead of us would part and we would encounter a chitlin dropping a steaming deuce on a public sidewalk, garden, or even once in a restaurant was downright frightening. The parents resemble dog owners who let their kid do their business and watch on. Most studious parents pick up the mess but some uncouth guardians leave the land mine and slink off. This can lead to an awkward situation for the passerby who fails to notice the booby trap. Stepping in dog poo is bad enough but fresh, smeared baby poo on your foot is downright repugnant. Normally one would expect to be able to stroll along a sidewalk and not encounter human feces but in China a walker does this at their own peril. 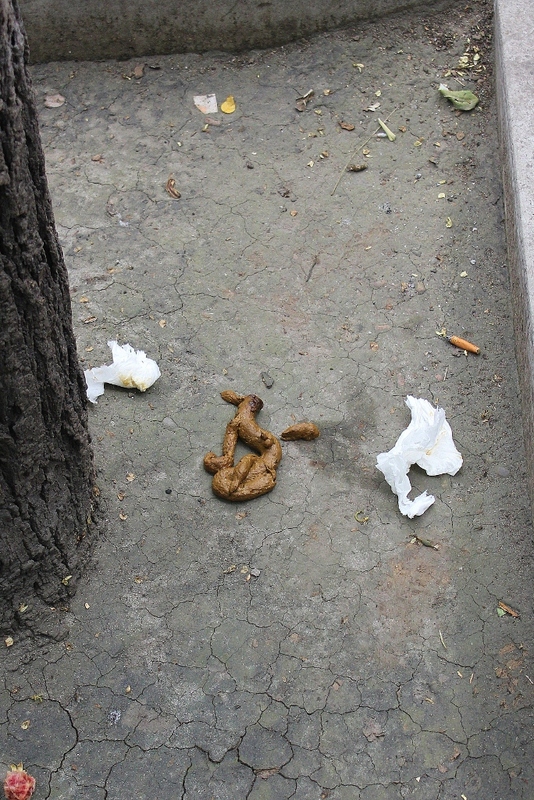 The first time we witnessed a baby letting loose a steamy pile in the walkway we gawked at the incident in disbelief. The mother finally hid her baby from our judging eyes and then glared at us…as if we were the indecent ones!! Like I said, China has a different culture than us. When they own us in 10 years we’ll ALL be wearing splitties! Muahahahahah!!!! That is my secret hope! I think you’re jealous. New Symrna springs to mind. It is real my friend…real disgusting. I had no idea about the Vietnamese way. Thanks for opening my eyes! 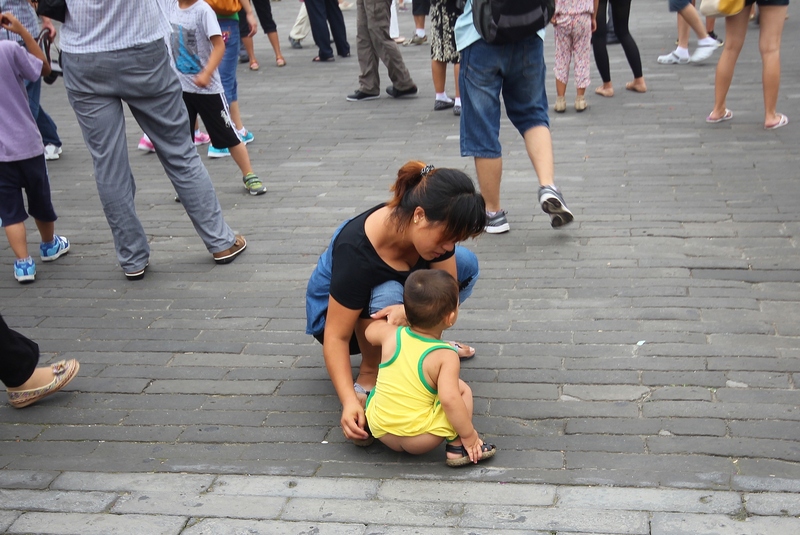 I also dislike the kids peeing or shitting whenever or wherever they want,I think their parents should take some actions to avoid this especially in the famous resorts. the pic of Chinese landmine let me feel sick. I think the parents should stop this nonsense as well. The pic of the landmine is nauseating but think about the poor schmuck who gets the explosion on his foot! We did our best to stay out of the landmines…others we saw were not so lucky. how many tirds did you drop on the sidewalk ross!?!?!? safe travels to you two!!!! Thanks brutha! I tried to leave my mark on Chinese soil but mean Nug wouldn’t let me.